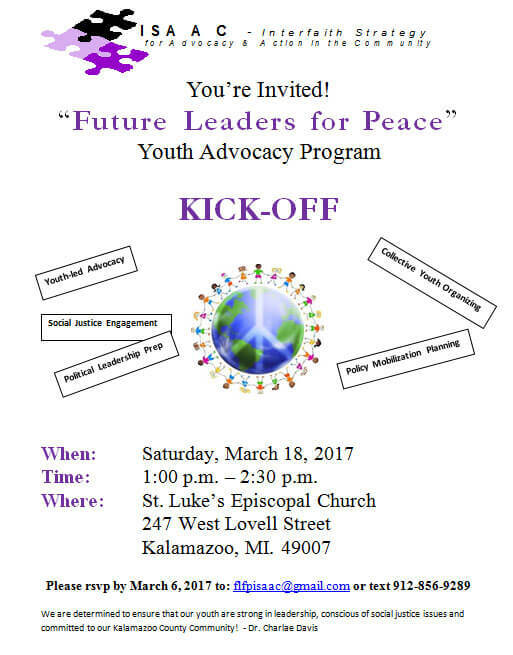 The Youth Violence Prevention Task Force (YVPTF) is kicking off our Future Leaders for Peace (FLFP) program on Saturday, March 18 at 1:00 pm at St. Luke’s Episcopal Church. Please encourage youth within your congregations and various organizations to step forth and become the voices of their communities. Our goal is to prepare them to address issues of poverty, barriers to education, racism and institutional inequities, multiple forms of discrimination and limited employment opportunities. This community-organizing youth initiative is for youth grades 8-12 and will incorporate leadership preparation in various areas of government. We are excited to launch this youth-led arm of ISAAC. In February, the YVPTF partnered with the Coalition for Common Ground, Moms Demand Action and the NAACP in a service of Remembrance and Action for victims of gun violence. Those who have been affected by gun violence were able to come together to find kinship and comfort along with writing letters to elected officials and participating in a Be SMART presentation helping those in attendance to be able to talk about guns and gun safety with their neighbors.